Cases docketed to the Winter/December 2024 Term (begins Dec 4, 2023) must be decided by July 2, 2024. Cases docketed to the April 2024 Term must be decided by November 1, 2024 (November 3 is Sunday). Cases docketed to the August 2024 Term must be decided by March 14, 2025. Note: Distress Date For Cases Docketed to the August 2023 Term is March 15, 2024. MFR Distress is March 29, 2024. Distress Date For Cases Docketed to the Dec/Winter 2024 Term is July 2, 2024. MFR Distress: July 17, 2024. Distress Date For Cases Docketed to the April Term is November 1, 2024 (November 3 is Sunday). MFR Distress Date is November 18, 2024. 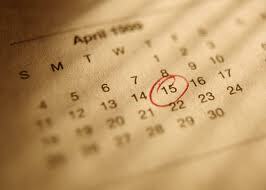 Distress Date For Cases Docketed to the August Term is March 14, 2025 (March 16 is Sunday). MFR Distress is March 31, 2025.